... a must not only for pilgrims. ... the 1st British Burmese capital. ... becoming a monk is not easy. 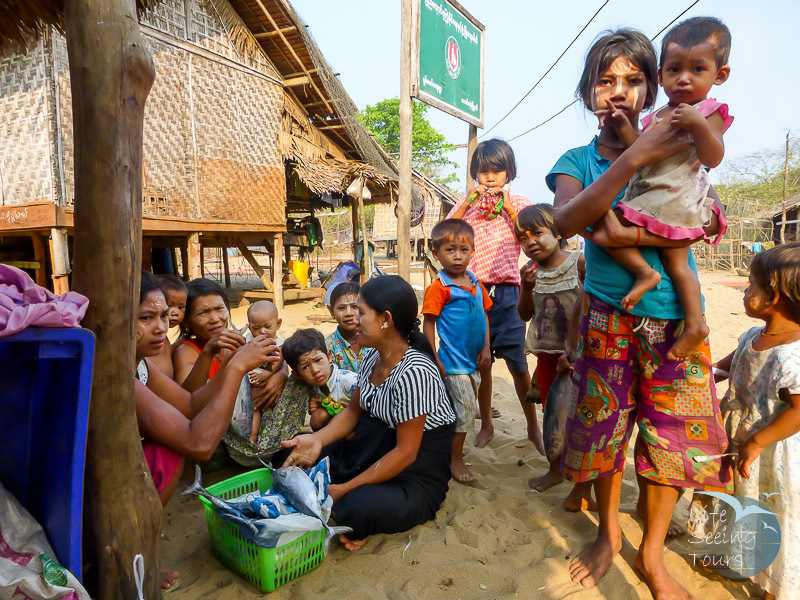 ... curious villagers near Myeik. ... working as well, near Kawthaung. After an early breakfast we need to procced to the train station. The train moves slowly through the outskirts of Yangon, ideal for getting an idea of the daily life along the train tracks. An attraction in Bago is the main market with a wide range of local products from food and household items to literally everything. After lunch at a local restaurant in Bago, we continue 3.5hrs/110km to Kin Pun base camp to change our mode of transport to an open truck. The ride is shared with local pilgrimage makers for the next 11km to Yathetaung base camp, located 500m below the summit ridge. From here we will take the cable car to a great view on the mountain. The Golden Rock, or Kyaiktiyo as the Burmese call it, is a fascinating sacred boulder covered in gold leaf and balanced precariously on the edge of a cliff. Crowning the boulder is a small shrine believed to contain Buddha’s hair relics, the source of the gravity defying magic. A continual stream of pilgrims from Myanmar and Asia come to witness the wonder at least once in their life time. Enjoy the tranquil sunset, soak in the unique atmosphere and share in wonder with fellow monk, nuns, and lay pilgrims. Wake up early for lovely sunrise views (if staying on the Mountain Top) and a quiet morning stroll. Breakfast at the hotel before descending back to the Kinpun base camp. We drive to the picturesque Karen State capital of Hpa-An, visiting enroute Thaton, one of the ancient Mon kingdoms, and the Thamanya Monastery, the home of one of Myanmar’s most revered monks. Our first visiting point is Lumbini Garden with Mt. Zwekabin as a scenic backdrop. The 1000 Buddha statues and the 722 Meter high mountain are giving the place a mystic touch. We enjoy traditional Burmese lunch at a nearby local restaurant (own account). If time permits we visit the bat cave, where more than thousands of bats come out every night to find food. The sky is darkening and it is said they fly as far as Mawlamyine to still there hunger. We learn about handmade clay pots at a clay pot workshop nearby Mawlamyine. Moulmein is still a trading town. We take some time to visit old and the new market in Mawlamyine and have a chat with the shop keeper and a snack here and there. The little shampoo island is just a stone throw away from the mainland. The name orgins from the Ava period, when the kings used to washed their hair here. It is a calm and beautiful place. Before the sun is setting we make our way up to Kyaikthanlan Pagoda, immortalized in Rudyard Kipling’s poem that begins: “By the old Moulmein Pagoda, lookin’ lazy at the sea/ There’s a Burma girl a-settin’, and I know she thinks o’ me…”. After breakfast we leave for one Thanbyuzayet. It is located about 34 km from Mawlamyaing and starting point of the Death Railway connecting Myanmar (Thanbyu Zayet Station) and Thailand (Bang Pong Station) with the Bridge over River Kwai, constructed by the Japanese during WWII. This Death Railways was started in May 1943 and official opened on 25th October 1943. More than 20.000 prisoners of war died during the construction period. The newly opened Railway Museum is well worth a visit. 10 Miles before Ye we will stop to visit the Banana Mountain from where you can overlook the whole Ye valley. The translation Banana Mountain comes from the Mon language. The tower at the top with its nine levels and nine different decorations are well worth a climb. After arrival in Ye we refresh at our hotel. A local brick factory on the outskirts of the town is showing us how bricks been made (seasonal). The local workers are delighted to show there hard labor to us and are always happy to be photographed. If there is enough time we can enjoy a marvelous sun set from the Ye Railway Bridge. After breakfast in Ye we will start our journey over a stunning mountain range, which divides the Tanintharyi Division and the Mon State. The drive is winding up and offers a stunning landscape. Before we reach Dawei we visit Nabule Beach, where the Burmese Government plans the biggest Deep Sea Port in South East Asia. You will find a nice empty beach stretch for yourself as finances of the project are unclear until today. Feel free to go for a swim. Please note there are no facilities at all. After arrival check in to your hotel for refreshments. Dawei is the capital of Tanintharyi division in the south of the Myanmar, formerly known as Tavoy. Dawei was one of the first cities, where the English settled after the 1st Anglo-Burmese in 1826. As a result the town has a long lasting history and picturesque buildings from the colonial times. If time permits we go for a stroll along Dawei’s interesting riverfront waterfront. Lunch and Dinner are own your own account. In the late afternoon we reach the well-known Maung Ma Gan Beach. Enjoy the relaxed and uncrowded beach atmosphere ( except holidays) with a sun downer and a delicious seafood dinner. Return to your hotel after a fabulous sunset. After breakfast we leave for Myeik. These 230 kilometers of road have been closed for foreigners for a long time. In past even locals needed a permit to pass that road, plane and ferry boats were the only way of transport. Just a few miles after Dawei we visit the Shin Mok Hti pagoda, which can be dated back to 1438 and houses original pieces of the bodhi tree. Our drive takes us through tiny villages. We will stop every now and then to discover the daily lives of the rural community. Lunch along the way in a clean local restaurant to your own account. We reach Myeik in the afternoon. Already in the early 17th century the East Indian Trading Company were unloading their ships at the ports of Myeik. Most of the goods would go inland and from there up to Tanintharyi and further on to the old capital of Siam Ayutthaya. The rest of the afternoon is for your own leisure. Lunch and Dinner are to your own account. After breakfast we will start our discovery of the Mergui Archipelago. We leave from Seik Nge Jetty (Main Jetty) in Myeik. We observe the daily life of the fishermen during a short visit of one of the villages along the way. After about 2 hours cruise along pristine waters we reach an inhabitant beach with snorkeling possibility. Now it is time to relax and kick back. Go for a snorkel in clear waters or just enjoy in the shade on the beach or float in the ocean or just play on the beach. We stop in one of the villages and enjoy fresh cooked lunch there nearby the beach. Enjoy the beach and forget about the outside world. We will return in the afternoon to Myeik. Please note: The Mergui Archipelago will be a joint tour with other customers. Program might change on tide and weather conditions. We advise not to participate if you are pregnant or have back problems. Arrive breakfast at your hotel we start to explore Myeik is one of the biggest fishing towns in Myanmar. After breakfast we transfer you to the airport for your flight to Kawthaung. On arrival at the airport you will be welcomed by your guide and driver. It is very little known about the city’s history formerly known as Victoria Point. Before Kawthaung established itself, Maliwan was the main port in the most southern part of Myanmar, but the shores were too shallow for the big ships. So Kawthaung was founded in the late 19th century about 25 Miles to the south. Our first stop is Mali Wan Waterfall. The all year waterfall and its park is a great place to have our have some snacks and take a swim in the refreshing waters..
We will visit the famous King Bayinnaung statue, which is greeting visitors from the cape. It is said he was very much accepted in Thailand for his policy to leave the country ruling be his own King. Bayinnaung only demanded loyalty. Nearby Victoria Point is the most Southern Part of Myanmar and a great photo opportunity. Our last stop of the day is 5-5-5 Mountain as the locals call it. The hill offers a spectacular sunset view over the whole town and nearby islands of the Mergui Archipelago. After breakfast if time permits we take you to the tax free market in the down town area. The goods come straight from Thailand and can be paid in Thai Bhat. We visit the busy water front again see the long tail boats going back and forward to Thailand. Now it is time to say good bye to Kawthaung and prepare for the return flight to Yangon.